THE Cities of Manchester and Birmingham have had some very hard battles over the years, but Roy Paul always insisted that this F.A. Challenge Cup sixth round match at St. Andrews was the toughest of them all. And Johnny Hart, one of the most loyal and conscientious players that football, let alone Manchester City ever had, has more reason than most of us to remember it. The crowd of 58,000 (receipts £8,450) frankly was bored for most of the afternoon. There were long spells of negative play chiefly because of the keen and quick tackling on both sides, and the haste with which most of the defenders booted the ball to the opposite end. Warhurst kept a close watch on Revie who was anything but a happy wanderer this day, and the other City forwards lacked imagination. Not that Birmingham were any better although this did not detract from some splendid work by Ewing and Meadows, while Trautmann made two superb saves from Murphy and Smith. Generally, however, the proceedings had deadlock stamped all over them, and some of the scribes already were making arrange-ments for a replay and had written their reports to that effect. I regret to say that I was one of them. Then in the 88th minute, Boyd gave away a free kick on the edge of the penalty area. Clarke’s shot was a fierce one, but Merrick had the ball covered and he might well have stopped it if Hart had not moved-intentionally let it be added-into the line of flight. The ball was deflected onto Merrick’s outstretched right arm whence it entered the net. Birmingham said it was a sheer fluke, but they found nobody from Manchester who agreed with them. 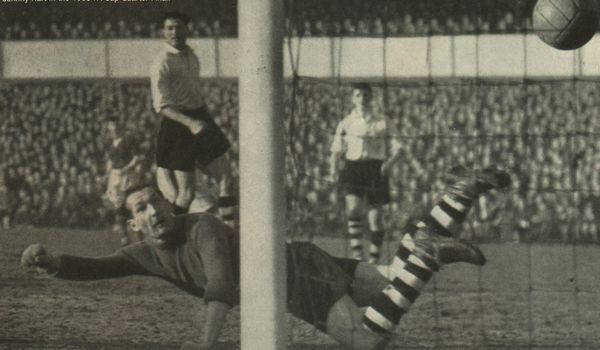 A minute later, Smith put his head to a corner kick, and although Trautmann was beaten, Paul headed the ball off the line and Manchester City were home.